A collection of essays from Mark Greif, the co-founder of n+1, addressing such key topics in the cultural, political, and intellectual life of our time as the tyranny of exercise, the tyranny of nutrition and food snobbery, the sexualization of childhood, the philosophical meaning of Radiohead, the rise and fall of the hipster, the impact of the Occupy Wall Street movement, and the crisis of policing. The essays have a habit of changing direction in midair, sticking the landing as earnest entreaties for change ... The book succeeds on the strength of its deadpan and sometimes disarmingly bizarre humor. It’s especially important that most of the laughs come at Greif’s expense ... The essays come off not as posturing, but as the exertions of a formidable mind using every tool at its disposal for what Greif considers an all-important task. Greif wants to meddle in our lives, not just for the sake of the collective good, but for the sake of the individual, for your sake, to make sure that you do the serious thinking necessary to achieve self-fulfillment...Advising his readers on how to lead their best lives, Greif can sound like a perversely sophisticated inspirational thinker or self-help author ... The masterful ease with which Greif escorts his readers through the steps of his arguments can sometimes obscure his constant jumps from one genre of discourse to another. ...this collection decodes subjects both Hi and Lo, from the meaning of life and the philosophy of contemporary warfare to the implications of rap and reality television ... There is more than a whiff of the student Marxist in him, but instead of narrowing his view, this slightly censorious impulse lets him see things most of us prefer to overlook ... There is, in truth, nothing that Greif writes that doesn’t have a kernel of interest at its core, even if his prose frequently bristles with abstractions ... In our dumbed-down, social-media-­driven age, Against Everything embodies a return to the pleasures of critical discourse at its most cerebral and personable. 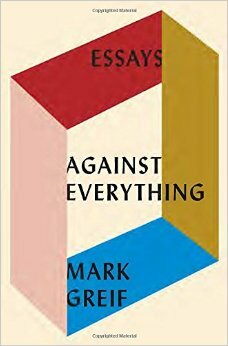 What did you think of Against Everything?